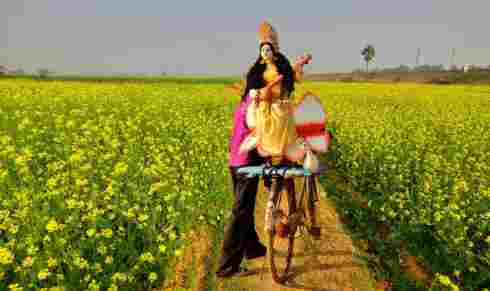 Representational Picture courtesy-s3-ap-southeast-1.amazonaws.com shows idol of Sarswati godess being taken for celebration as mustard fields are blooming. Come February 1 and the students across Jharkhand,Bihar,West Bengal and Orissa will celebrate Sarswati Puja. To celebrate,the idols are being made and polished by artists in different parts of these states.And students collecting donations from people,especially parents and businessmen. Sonia Verma in her article-Sarswati Puja:Significance and celebrations-published by metaphysics-knowledge.com writes about the festival.In fact,it is celebrated usually on the day of Vasant Panchami, the fifth day of spring. The exact date of the festival keeps changing every year as per the Hindu calendar. Apart from the Hindus, this day is also celebrated by the Sikhs. This day is celebrated as it initiates the spring festival. The colour that is associated with this festival is yellow. This colour is significant as during this time mustard flowers are blooming everywhere. People prefer to wear yellow clothes on this day as they worship the goddess. Even food items that are prepared on this day are generally yellow in colour. The food items that you will often see on this day are sweet saffron rice and yellow sweets. Saraswati. She is also considered as the wife of Brahma. In Punjab the Sikh community celebrates this day with a lot of devotion. On this day the musicians in gurudwaras perform the basant raga. In some parts of Punjab fairs are also arranged on this day. This is the day when Guru Govind Singh got married so it makes the day even more special. Even in Tamil Nadu this day is celebrated. It is the ninth day of the Navratri in Ashwin month. In Firozpur this day is celebrated with kite flying. If we look at traditions this festival was originally more dedicated to Kamadeva. Lord Shiva had turned Kamadeva into ashes. The wife of Kamadeva did a very tough penance for continuous forty days. At the end of these forty days lord Shiva felt pity and he gave Kamadeva his life back. This day was vasant Panchami and as a result this day started to gain importance. Dhol players and dancing girls would come to the royal palace and perform on this day. The songs that were sung on this day were dedicated to Lord Krishna and the gopis. Soon after the celebrations some gulal would be applied. The gulal was significant of the fact that Holi is approaching fast. This day is still considered as a good day for marriage in many parts of the country. A lot of marriages happen on this day. Saraswati puja is a very important puja. If you please the Goddess Saraswati she can grant you with a lot of knowledge and talents. The people who are affected by Rahu must worship the goddess Saraswati regularly. She is the mother of the Vedas. Some say that she is the daughter of Lord Shiva and goddess Durga. There are many more theories about her origin,writes Verma.